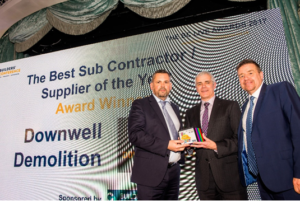 Congratulations to Downwell Demolition, winners of the Builder’s Profile sponsored Best Subcontractor/Supplier Category at BCLive Awards 2017. The ceremony was held in the beautiful ballroom of the Savoy Hotel, 6th December and hosted by BBC Broadcaster, Mike Shaft. Five new award categories were independently judged as well as the ultimate accolade for the Main Contractor who topped the BC Live League table 2017 for the highest value of contract awards secured in the year. Downwell which offer demolition and enabling works services for major redevelopment projects in London and The South East became worthy category winners for over 100 years of Demolition management experience. Paul Long, Builder’s Profile Managing Director presented the award to Steve Padmore and Alan Knight of Downwell Demolition.